Do you want to help GNU/Linux community? 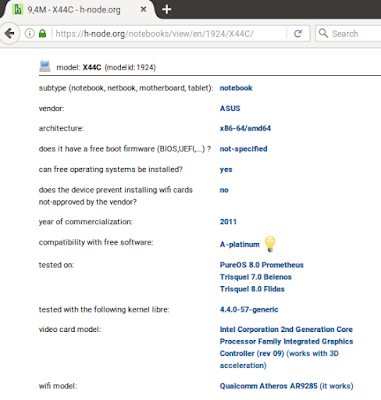 There is a simple way for beginners: enter your laptop specification to FSF's h-node.org Hardware Database. What you need to do is: run a fully free GNU/Linux distro on your laptop and submit your laptop specification. 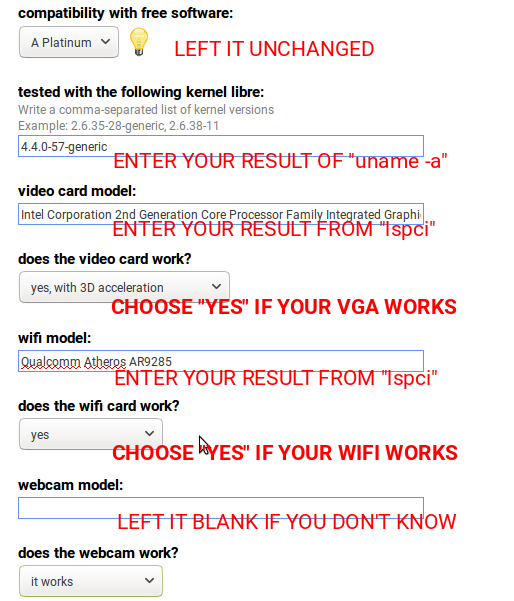 Simply test if the WLAN, VGA, and webcam are working or not working. As simple as that! This short article explains easy steps to submit to h-node. Happy contributing! The goal of h-node is listing hardware for fully free distros, so, we cannot use Ubuntu or Mint, because there're not fully free. A fully free distro (sometimes called 100% Libre distro) would only provide free software, without any single of nonfree software. 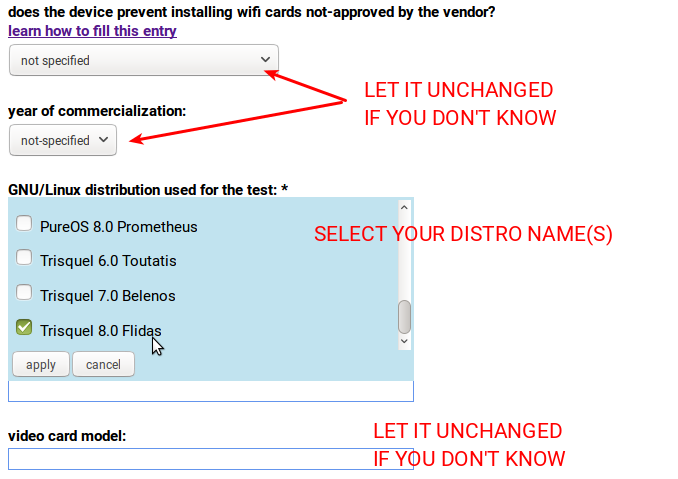 I recommend you to use between Trisquel, PureOS, or Debian* for submitting. If you don't know which to choose, start with Trisquel. Those are all desktop and easy-to-use OSes and they can run in LiveCD mode. I don't recommend Parabola, GuixSD, or Ututo unless you are an expert user. I used Trisquel for my submission on ASUS X44C here. *) make sure if you test Debian, disable first contrib and nonfree repos. However, Debian is also not endorsed by the FSF. Can it be installed successfully? Just use Trisquel LiveCD if you cannot install it. First, register yourself at https://h-node.org/users/add/en. This registry needs email verification. 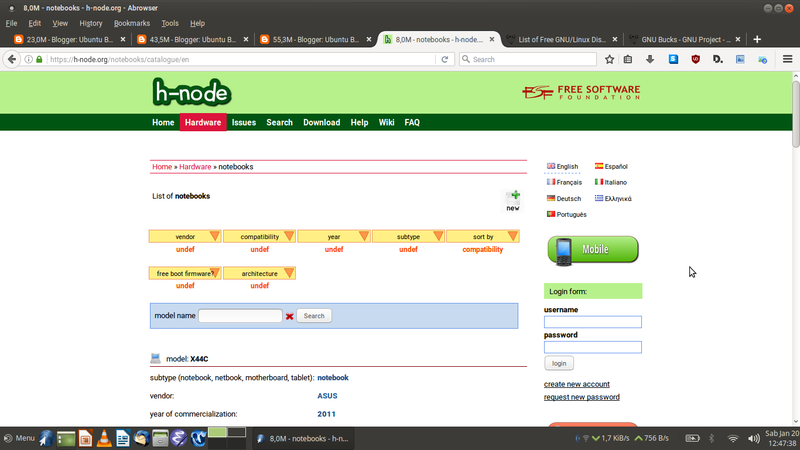 Then login to h-node using your new account. 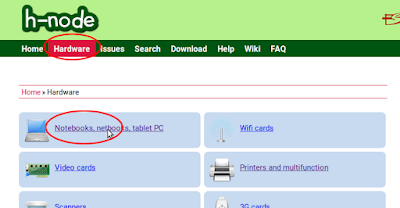 Second, go to the Notebook Category page or click page menu HARDWARE > click Notebooks. This page gives you laptops by brand ("vendor") or year. 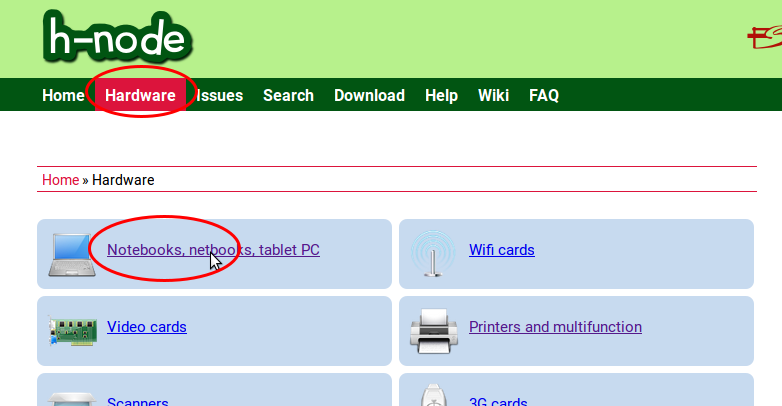 Third, still at Notebook Category page, click "+ New" button on the top. 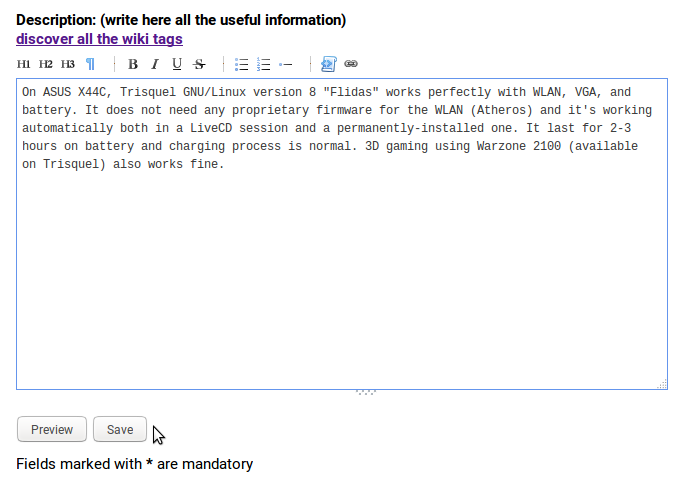 Part 1 of the data entry, enter basic info of your laptop. For example, my laptop is ASUS X44C 64 bit, so I enter my data to look like picture below. 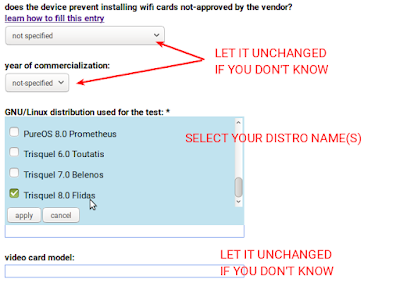 Don't forget to select "YES" if your laptop can run Trisquel or another 100% Libre distro. 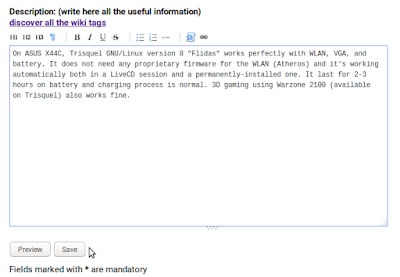 Part 2 of the data entry, enter the most important info, the 100% Libre distro you used to run the laptop. 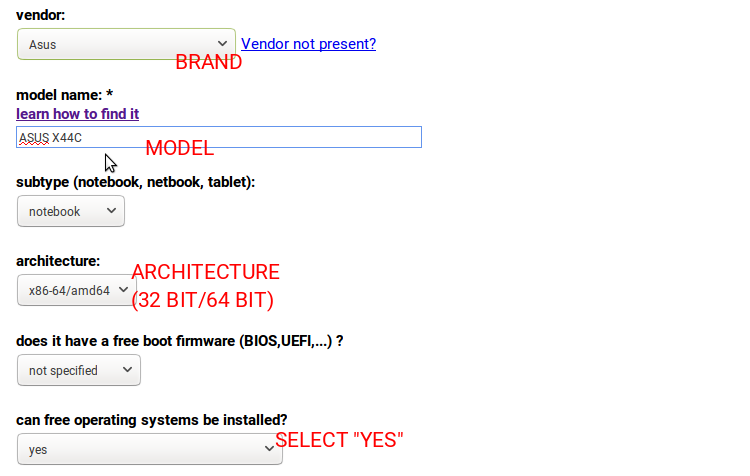 Check the checkbox and click Apply button. For example, I tested my X44C with Trisquel 8 so I select Trisquel 8. 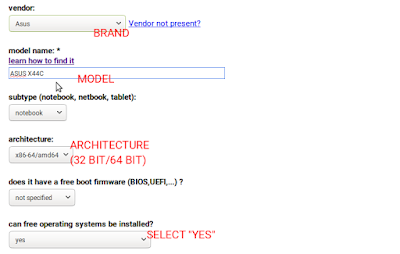 The last part of the data entry, enter your specific hardware-compatibility info. You will need t run first command line, second command line, and third command line below to know the kernel version, VGA model, and WLAN model, respectively. See picture below about how to copy-and-paste them. Submit your entry by pressing "Save" button at bottom. Before sending, you can add some commentary about the laptop on the Description box. 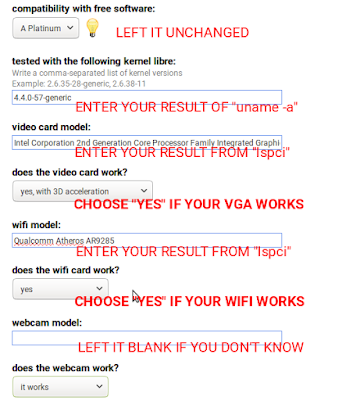 For example, you may add "wifi works perfectly, plus AP hotspot can be created" if it is true. Do not worry, you can edit your entry later. Congratulations! 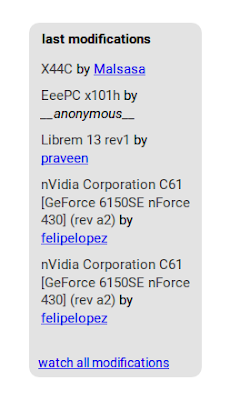 Once submitted, your laptop info will get a page like my X44C at h-node.org. See this picture. Plus, your entry will be featured on sidebar at the main page of h-node website. Do you have more laptops? Send each laptop info to h-node. 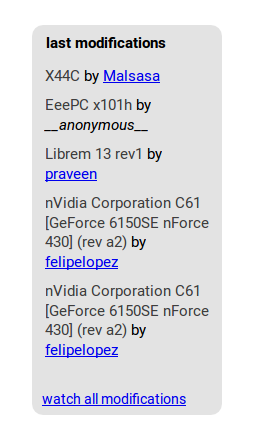 Do you have friends using GNU/Linux (specifically, the 100% Libre one)? Recommend your friends to follow your contributions to h-node or by showing this article to them. Your contribution helps people. Happy contributing!